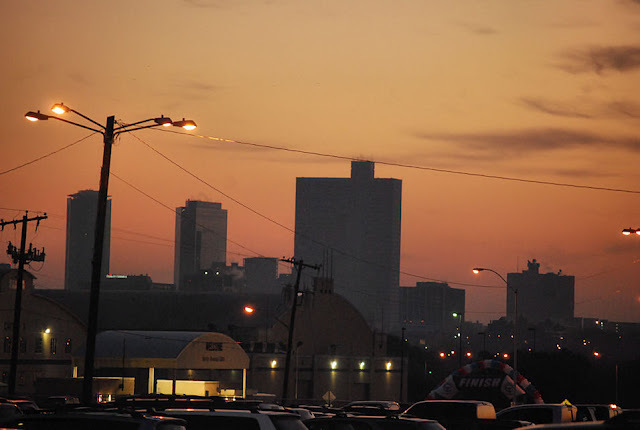 This was taken just as the sun was coming up from the parking lot of the Cowtown 5K & 10K. You can just make out the balloons over the finish line. See other Skywatch Friday sites here. Second round of the iHigh photo contest is over. I just made the top 10. Next up will be a week of voting for the top 5 spots. Click the photo of the baseball player on the right and vote for me. Click the iHigh link to the right for todays Tiger schedule or just click here. Have you checked iHigh to see if your school has a site? Tomorrow is the Mardi Gras Run at Galatyn Park in Richardson, Tx. Its the same course as the Super Bowl XL run. I liked that course, so I am looking forward to tomorrows run. The Fountain 5K in Terrell has registration information online. I'll post a link to it on the Monday Morning Mashup.